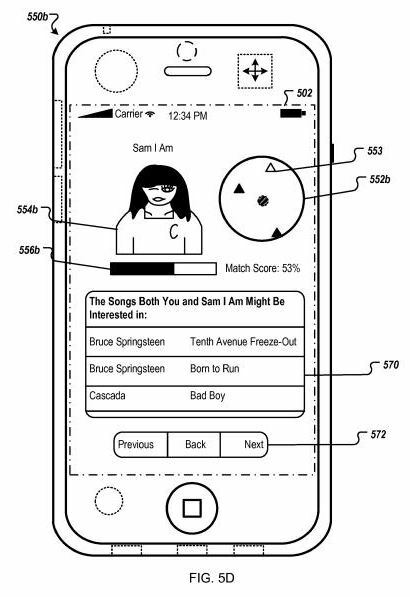 A patent application was published at the USPTO this morning that describes an interesting new application from Apple, enabling people to find others with common interests or common experiences or both, based upon location. The patent is fairly detailed, and I’ve somewhat brushed the surface with my description below. If you’re interested in location based services and social networking, it’s definitely worth a read. 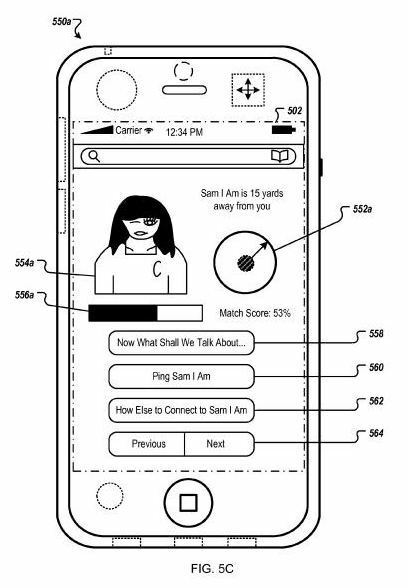 It also has some of the more interesting images that I’ve seen so far in a patent filing this year (The person shown in them looks a little like a comic book villian), and they do a very good job of displaying an example of how this system could be used. 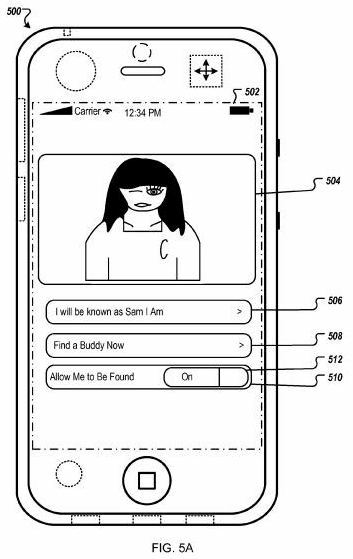 A “buddy finder” feature is depicted above, and described in the patent as an illustration of one of the possible ways this ad hoc social networking technology might be used. This feature would allow you to create a personal profile or a personal preference list to specify what kind of people you would like to meet, but those don’t need to be filled out to use the feature. When the “buddy finder” is turned on on your phone, it enters a passive “ready” mode to enable it to received inquiries of matches from other mobile devices, participating in ad hoc networking based on content and location. Some of this information might come from the profile or personal preference list I mentioned above, and some might come from usage history of the phone from its users, including information about downloaded songs, movies, and other content, such as the names of artists and performers, composers and directors. Other user data that could be used in the system might involve a contact list, including information from caller ID and numbers dialed from the phone. 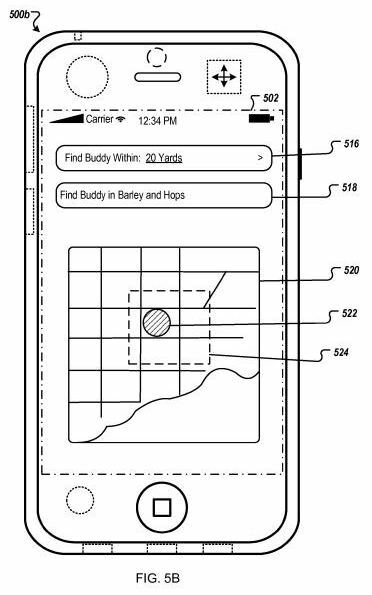 The buddy finder would let the person searching know that there is someone with common interests or experiences nearby, and let them know what they have in common with the people located by the friend finder function, and can include geographical coordinates of the matching device or devices. The image below shows some of the matching user data that might be shared, to let people know if they want to meet. This information can also act like, as the patent filing refers to it, an icebreaker to encourage conversation. The patent filing does address some privacy issues, telling us that usage data can only be created by explicit consent from a phone owner, either during signup with the ad hoc network, or during other activities. The user can also choose what kind of information might be excluded, such as financial transactions, email content, browsing activity, use of specific applications, exact location data, and more. Transmission of the usage data can be encrypted as well. Methods, program products, and systems for ad hoc networking based on content and location are described. A user of a mobile device can identify another user using another mobile device who is close by, if both users have requested to participate in networking. Common interests and experiences of two or more users located close to each other can be identified from content, including automatically created usage data of the mobile devices. Usage data of a mobile device can be created based on activities performed on the mobile device (e.g., songs downloaded), a trajectory of the mobile device (e.g., places traveled), or other public data available from the mobile device (e.g., pictures shared). Each of the users can be notified that another user having the common interests and experiences is close by. A means of initiating communication can be provided to the users to facilitate communication between the users. Google does have a somewhat similar product called Google Latitude, which enables you to see the location of your friends. But, unlike the Apple Buddy Finder feature above, it doesn’t work as an ad hoc social network, introducing you to new people who might share common interests and experiences. The information that Apple collects regarding the locations of its users is under considerable scrutiny by members of Congress, who are introduced legislation yesterday to protect consumer privacy. In addition to requiring that service providers like Apple and Google make it explicitly clear that they are collecting location based data for some services, it also requires that those disclosures also make users aware that the information could potentially be shared with developers and others who might use the information for marketing and other purposes. I probably wouldn’t use a system like this, regardless of its potential to help me find people who may share some common interests, but I could see how it might potentially interest many others. Then again, imagine going to a club or conference or meeting or baseball game, and instead of people interacting or watching the game, everyone is staring into their phone. Will a system like this make it easier for people to interact socially, or will it have a little of the opposite effect? Location based services are a very powerful tool. For me, I just needed a simple application to help me with reminders. I had been searching for an iPhone application for location based reminders that works without using GPS (which dramatically reduces battery life). I ended up developing my own application to do just this. LocationMinder on the iTunes App Store allows you to set simple location based reminders. The location can be set by searching for a business, by address, or manually on a map. This reminder is then delivered the next time you are near that area. The advantage is that it uses a new technology only in the iPhone 4 that continuously monitors your location without the high power of GPS. The application also does not need to be running to receive the reminder. I would love some feedback on the application. Well technology wise this is a great tool but where will this GPS based networking end? I have the image of a guy in my mind sitting in front of a sympatic looking girl and checking his iPhone first before starting to talk with her. 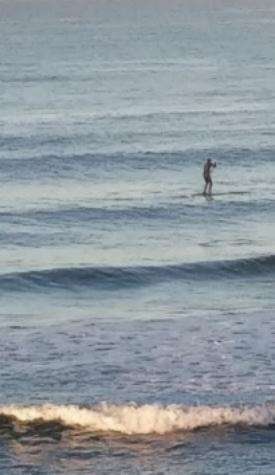 What’s the next step? Will the app compare his/her ex-friends, tell you why they broke up? Maybe there will be a “jailbreak-version” on the market later including the options “easy to hook up with girls 20 yds around you” or something worse. Just kidding, but it’s simply that I am not the biggest fan of the way social networking is beconing this days. This seems to be an extended version of Foursquare with far more advanced features. This is another evidence of the future of a Mobile marketing which is evolving at a great pace.Need to look how far will this be successful considering the privacy issue.Great post and thanks for sharing. Wow! What a clever app that would be. I’d love to see it in use, could quite possibly change the way we meet people and make friends! Location based services are multiplying on the web very quickly, and I would guess in good part that has to do with increasing numbers of people using phones to connect with the web, more capable phones that can use more sophisticated applications, and the mobility that one has when they carry their computer around with them in their pockets/backpacks/purses/brief cases. It sounds like a good move to not have to rely upon GPS for the application that you’ve developed. I like the sound of location based alerts – they could be very useful. There are definitely some pluses and some minuses with the growth of location based social networking applications like this one. Many of the things that sound like they might be great features can potentially have darker sides. To quote a cartoon that’s been online for probably more than a decade, “On the Internet, nobody knows your a dog.” We’ve seen a few bloggers recently be revealed to have created false identities for themselves as exercises in creative writing, with one supposedly “arrested” in Syria stepping up to confess the subterfuge when the US Embassy was going to step in with a rescue attempt. I can see the potential for fairly innocent and meaningful uses of this location based social networking approach, as well as potentially much darker uses. I hope that anyone who might use something like this exercises some level of caution in meeting people who might be total strangers, and possibly even not whom they say they are. I never quite got into Foursquare. I’ve never felt really compelled to share with everyone that I just stopped off at the local convenience store, or that I’m away from home. I can see using a location based social networking feature with people whom I already know, though. It will be interesting to see if Apple decides to move forward with this. I can see some potential for people to use this with marketing, though the patent filing doesn’t really present it as a marketing tool. Interesting point. I do wonder how often most people do use the apps that they download. I’ve seen some useful looking ones, and some that don’t seem like they would have much use. It does seem like it has the potential to increase opportunities to make friends. Guess we wait and see. I can see the potential for business accounts using a social networking service like this, but I wonder if businesses would get more out of it if they let people who worked for them to use it as themselves, and avoided being overly promotional. I’m thinking to a degree of how companies like Comcast have been using Twitter to address tweets. Rather than a single Comcast twitter account, they seem to be much more effective when there’s a real identifiable person at a number of comcast twitter accounts – a real person whom they can have conversations with, and who takes a personal interest in helping when there are problems. Very interesting, but I agree there is a darker side and lots of potential for misuse. There would need to be a fair degree of scrutiny to address privacy and safety issues… particularly where minors are involved. Definitely safety and privacy concerns should be considered very carefully in setting up something like this. I’m wondering if parental controls might also be something that could be baked into it as well. I am already excited how it will go. But I agree with Steve… there is a great potential for misuse and this should be taken into account. For me this seems like Apple are trying to make their own waves within the ever-growing social networking field, something that seems to be a mystery as to me, after all, the social networking niche is dominated already by web based companies rather than hardware. Is this a positive move by Apple, i don’t think so as i think that their money would have been better invested elsewhere. I think given the success of the iPhone, it makes sense for Apple to explore different location based services that they can offer iPhone users. I’ve seen a few other social networking based services that they also might consider offering to their users as well. For me there are a couple of issues. First, there are clear privacy concerns around these types of products, but I guess that Apple would argue that upfront consent is required. The second concern of a more practical nature: if the service reqires GPS to be turned on, then it will be major battery killer! Apple has been challenged publicly about their collection of location-based data, and I have seen the consent argument from them. That may sit well with some people, and not so well with others. The battery life of phones is definitely holding back the use of GPS to be used with services like this, but there are other ways of determing locations using things like cell tower triangulation and identifying wifi connection points. Previous Previous post: Google’s Quality Score Patent: The Birth of Panda? Next Next post: Will Google Start Showing Ads and Other Content in Unused Whitespace in Your Browser Window?